Dealers who are buying scrap gold do not offer the market price of the gold value, rather you will normally get between ten and twenty percent less than the market price of the scrap gold value. First all of the scrap gold needs to be divided according to the karat amount of the gold. This can be ten, fourteen, twenty four, or others. The scrap gold value will depend on the karat value of the gold. Twenty four karat gold is very close tp pure gold, while fourteen karat gold may only contain slightly more than fifty percent gold, with other metals added in. The lower the karat value is, the lower the gold scrap recovery price will be. Another factor that will help determine the scrap gold value is whether there are other forms of value to the gold, besides the value of scrap. Some coins have a much higher value based on their age, history, or rarity, and may be worth much more than the normal gold commodity price offers. Scrap dental gold is one form of scrap, and is often turned in for recovery and recycling. 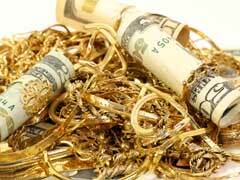 Once you have scrap to sell, you will need to determine the scrap gold value so you know what you have. Look up the current scrap gold price, which fluctuates frequently. Next divide the karat amount of the gold by twenty four, to get a decimal in most cases. Multiply this decimal or number by the current price of scrap gold. This will tell you the value of the metal that you have.